You might not know what a time weighted return is but it’s a very important concept to understand if you want to evaluate true investment performance. I realized this yesterday as I was speaking with William. Even though he is an experienced investor he didn’t have a clue about this concept. As a result he was jumping to the wrong conclusions about his investments and making some very bad decisions. In fact, even though he made some great investments for his retirement, he found it impossible to stick with them. I am pretty sure William is going to make better investments now that he gets the idea. And a conversation about time weighted returns will probably benefit you too. The good news is you intuitively already understand it. Let’s say you hire a contractor to install a sink in your home. It takes her 4 hours to complete the job. You pay her hourly wage and happily start using your sink. You like the sink so much you decide to have Kate the Contractor come back and install another one. Kate tells you she’ll start the job tomorrow morning at 8 a.m.
You trust Kate so you leave the key under the mat for her to come in and do the work. You come back at noon and see that Kate isn’t even half way done. You assume that Kate’s been raiding the ice box rather than installing the sink so you let her have it. The only problem is Kate got to your home an hour ago. She was delayed because of an emergency. So even though you think she’s been working (and charging you) for four hours, she has really only been there for one hour. This is an example of ignoring the time weighted return on your investment in Kate. You assumed that you were getting a poor return on the hourly rate you pay Kate but actually the return is the same as in the first installment job. 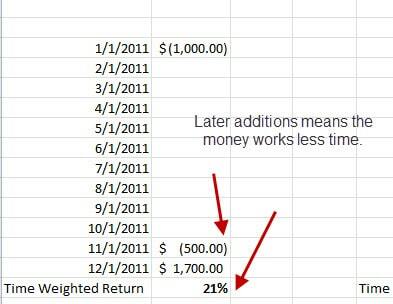 So time weighted return looks at how much you invest and when you invest. This helps really level the playing field in evaluating performance. Let’s apply this to money and reinforce the concept. If I told you I invested $100 and now it is worth $200, do you think I made a good investment? Well I did get back twice what I put in but that doesn’t mean I’m smart or that the investment was a good one. Why? Because until you know when I made the investment and when I cashed in, you really don’t know very much. Also, without having that information, you really can’t compare that investment to any other one. This is true whether you are investing in a business or evaluating mutual funds. Let’s look at the investment again. If I told you that I invested that $100 last year you be pretty impressed. But if I told you that I invested that $100 four decades ago, you probably wouldn’t be so excited by my investment acumen. And you’d be right to feel that way. When you figure that it took me 40 years to double my money that means I earned very little. That my friend is a time weighted return. How do you calculate time weighted returns? Type in the deposits as a negative number and the value of the account as a positive number. The negative makes sense because it is money you took out of your pocket and invested. The positive is used because that’s money that you got back. In this example, your return is 21%. Pretty good. If I make that additional deposit earlier in the year, the return goes down. Why? Because the money was working longer and since the end result is the same ($1700) the return is lower. The deposits in the first example were made later. That money had less time to earn for you. If the end result is the same it means the investment must have had a higher return. Use the excel function to calculate your time weighted return on investment. This will help you evaluate and compare investments. Even if you don’t use the formula, now that you understand the concept, it should help you think about your money a little differently. Don’t just look at the bottom line. Consider when you invested, what you invested, what you withdrew and when in order to really understand your returns. Is time weighted return a new concept for you? Do you think this will be a good tool for you?